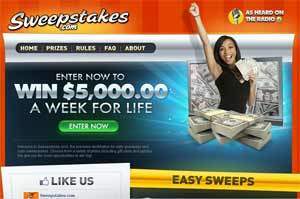 Sweepstakes.com – $5000 a Week for Life Sweepstakes. The online sweepstakes company, Sweepstakes.com Interactive Media, LLC. is offering you the chance to win their big grand prize consisting of $5000 a Week for Life. Many websites offer online contests. And users are increasingly enthusiast of these free games where they can win cash prizes. Put the odds in your favor by entering this online sweepstakes. You could be the lucky winner of their big lotto prize! A huge sum prize of $5000 a Week for Life is being promoted by Sweepstakes.com Interactive Media, LLC, enter now. By winning this jackpot, all your projects will soon become a reality. The Sweepstakes.com $5K a Week for Life Sweep stakes is open to us citizens aged 18 and older. Sweepstakes.com 5000 a week for life promotion ends on December 20, 2013. To enter visit sweepstakes.com and follow the on-screen instructions. No purchase or payment necessary. Grand Prize and Bonus Prize. One Grand Prize winner will receive $100,000 and the chance to win $5,000 per week for the rest of their life (the “Bonus Prize”). Approximate retail value of the guaranteed prize is $100,000. Approximate retail value of the Bonus Prize is up to $10,400,000 – See sweepstakes com website for official prizes and rules for sweepstakes details. Www.sweepstakes.com have alot a great prizes to be won. Don’t miss your chance and visit their website today. Sweepstakes.com-PCH $5,000 a week for life. this is increase I appreciate PCH offering this NICE Sweepstakes I need to win financial Blessing it is a plus for me thank. PCH #5,000 a week for life Sweepstakes #4900 yes I want to receive this nice Prize and I hope I win it. entry me . I have been a buyer at PCH for many years.Would love to win the 5000 a week. PCH im Claiming my entry to Win $5,000.00 A Week For Life, gwy no. 4900, pls activate my entry so i can Winnnnnnnnn, with a “Special Early Look”……. Yes i wanna win $5,000.00 A Week. Gwy No. 3080, make me ur New Winnrr, thnx Pauline…..
PCH i wanna wanna Win $5,000.00 A Week “Forever” on Aug.28th gwy no. 3080…. PCH i wanna Win $5,000.00 A Week for Life, on June 30th…..
PCH yes yes yes i wanna wanna Win $5,000.00 A Week for Life!!!!!!!! On june 30th, gwy no. 3080….. I have always had a big family we all lived in a small home. My sister purchased it before Mom died and she will not share the things Mom wanted us to have she took everything. She will not let anyone go to visit the home place. If I had the money I could buy the land directly across from our old home and build a home for all of us to visit whenever we wanted. I know family can be petty but I cannot understand her thoughts at all. I would love to have a main cabin for my family and several smaller cabins for the rest of my family, like family should always be together. PCH Winning $5,000.00 A a week For Life, so make out happen for me, lol no seriously!!! Thnx Pauline….